Risk Management is applicable to all organizations, be they involved in manufacturing, service provision, project management, administration, not for profit, etc..
All organizations need to effectively and efficiently assess risk. Throughout the risk management process, all possible hazards need to be identified and linked to an understandable risk measurement and rating system, the rational for accepting risk needs to be clearly understood. Where high level risks are identified, risk mitigation or ideally risk elimination approaches need to be implemented. Where the residual risk remain high, then risk benefit analysis needs to be performed to ensure that the potential risks are appropriate to the potential benefits. The risk management process needs to act as the basis for making decisions with respect to design activity, process operation, process controls, … etc.. The assessment of risk, the evaluation, measurement, reduction and monitoring, all form part of the risk life cycle. 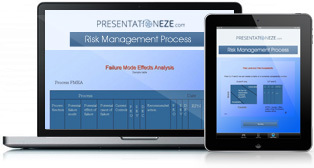 For those involved in risk management, there is a clear need to understand the risk management process, including the application of risk assessment tools, how to assess risk, how to implement a risk management plan, how to integrate risk into product and process design.